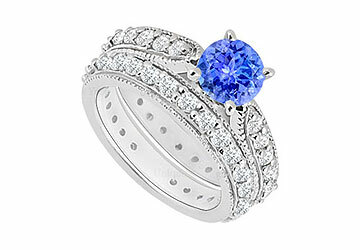 These complete sets of genuine engagement ring with wedding band set in the center a bigger round created tanzanite is prong-setting. Other smaller round CZ are set in between milgrain edges of the whole band attached by CZ eternity wedding band. Made in precious 14K white gold with total gem weight (TGW) of engagement ring 0.90 carat and wedding band 0.35 carat. It also available with seperate engagement ring model no.JS850AW14DTZ wedding band model no.W850BW14D.